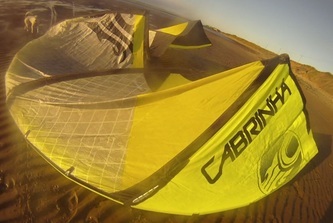 I'd never gotten my hands on a Cabrinha kite before, and after reading a lot about the IDS system was looking forward to giving the quicklink system a thorough inspection. The bar uses a clever system which feeds the safety line inside a the dual bore PU coated depower line, which connects up to the safety release system on top of the moulded chicken loop. The primary release is a standard push-away affair on top of the loop, but leaves you still connected to the kite via the safety system, which flags the kite onto both front lines. 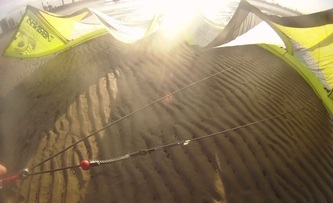 A secondary pull toward release is located inside the chicken loop which allows you to disconnect completely from the kite should you need to. It all seems very neat - the safety line is protected from wear and tear by placing it inside the PU tubing, and the whole system seems very well thought out. The chicken loop also features a spinning safety leash connection, a removable lock-in finger, and a moulded insert which fits neatly into the steel centre hole on the bar. Working up the depower line there is a large sprung section which tensions a couple of bungees leading to the webbing strap sheeting system. Its an elegant design which keeps the sheeting ropes tidily up against the depower line and also allows the user to push the bar up (compressing the spring) to provide extra kite depower on demand. 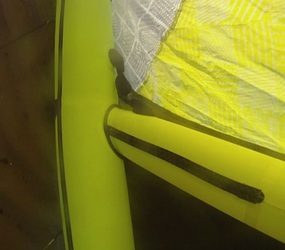 The kite connections also get the Cabrinha treatment and have an adjustable section near to the kite, allowing you to modify the line lengths without re-sheathing, should the need arise. 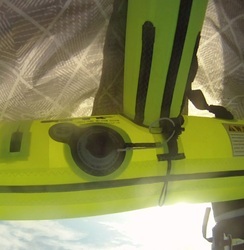 The kite itself features a largish diameter leading edge connected to five medium diameter struts, The whole kite is rigged with the sprint single point inflation system, which ensures you can get the kite up to pressure quickly and efficiently. The new canopy material looks very impressive and has a real quality look and feel to it. The White/yellow/black colour scheme looks the business also. The Switchblade is rock solid in the air, due to it sitting back a little in the window. The bar pressure is medium light on the freeride setting, with the option to make it heavier in the wake-style mode. Bar pressure increases as the wind strengthens - pulling your arms away somewhat and performing an auto depower of sorts. It responds well to assertive steering, yet ignores any small inputs - making it an excellent choice for those wake-styler's out there. When the bar is steered aggressively the Switchblade can be made to whip around tightly in a pivotal fashion for fast changes of direction. 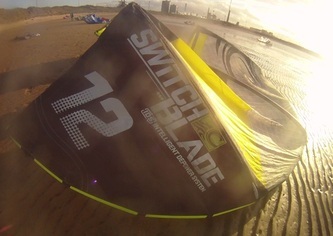 The Switchblade is a really grunty kite and has a great bottom end. Its stability, feedback and turning response make it a very easy kite to fly - it will just sit up there and keep pulling while the wind blows! The excellent bar and sheeting system is a pleasure to use and it all feels like a very well engineered user-friendly package. Its upwind performance is good, and relaunch is excellent - a prolonged pull on a steering line causes it to pivot and be back up in the air in no time; even in light winds. The Switchblade is a good kite to jump with, and its rock solid stability is great to iron out errors when pushing your riding and trying something new. 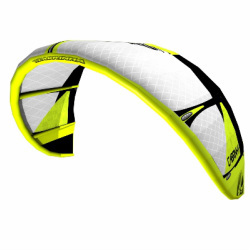 Its fast response to aggressive steering is great for redirecting the kite on the water or mid air. The kite performs very well unhooked, it parks in the air with great stability, and its provides some impressive grunty pop which keeps on going - taking you further and higher - a great kite for going big with. It doesn't slack a great deal, but this will please those who want that constant feel, or continuous pull for hitting obstacles. 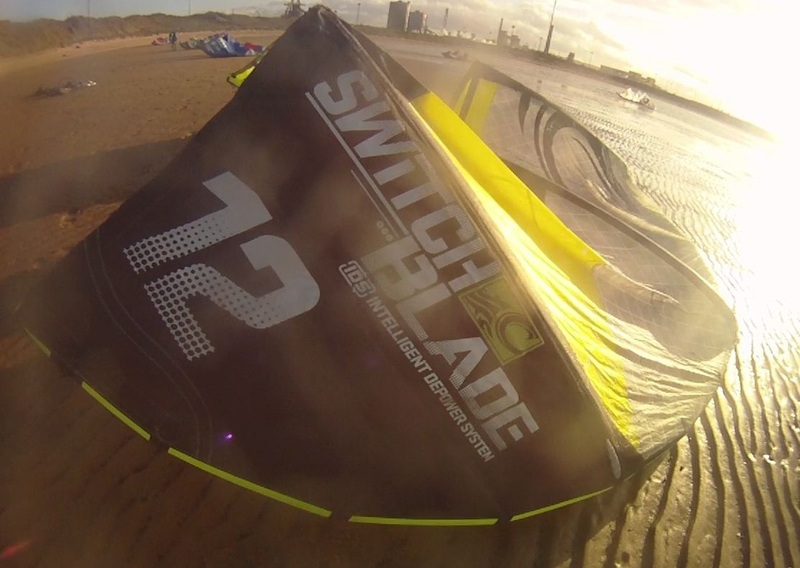 The switchblade is a versatile kite with great freeride and freestyle appeal, due to its stable handling, great low end power, forgiving characteristics and market leading control system. For wakestylers its a great kite to provide constant pull and bar feel, and its easy flying characteristics will appeal when getting technical on water, in air or sliding along a feature. For improved slack lining and powerful looping, check out the Nomad, but if its stability and predictability you're after, then you won't go wrong with the Switchblade.